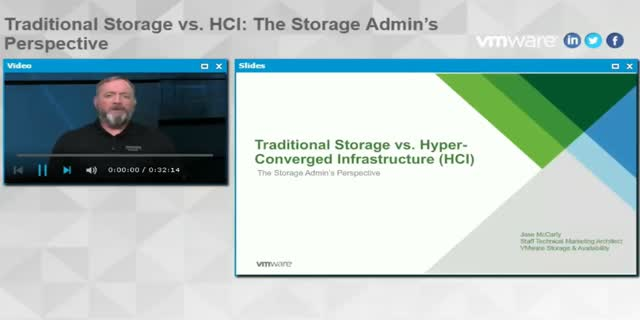 Are you a storage admins running business-critical workloads on vSphere? Replacing a traditional storage environment with hyper-converged infrastructure (HCI) solutions can give you a simpler, more efficient way to manage resources—and eliminate the guesswork that often leads to overprovisioning. Learn what HCI can do to alleviate some pressure. We’ll discuss how VMware Virtual SAN 6.2 powers HCI with a new operational model for shared storage, including features that complement high-end SANS. By offloading just one virtualized workload from SAN to Virtual SAN, you can save more expensive SAN or NAS for higher value workloads. Easy to learn, and with the broadest set of consumption models, see how Virtual SAN hyper-converged storage powers radically simple HCI solutions that solve critical problems for storage admins.